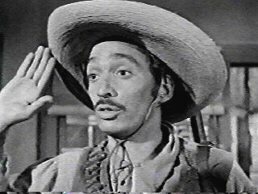 Notes: Roberto played "Ramon Hernandez" in his television debut on this episode of Have Gun Will Travel, a popular 30-minute Western that ran on CBS from 1957 to 1963. 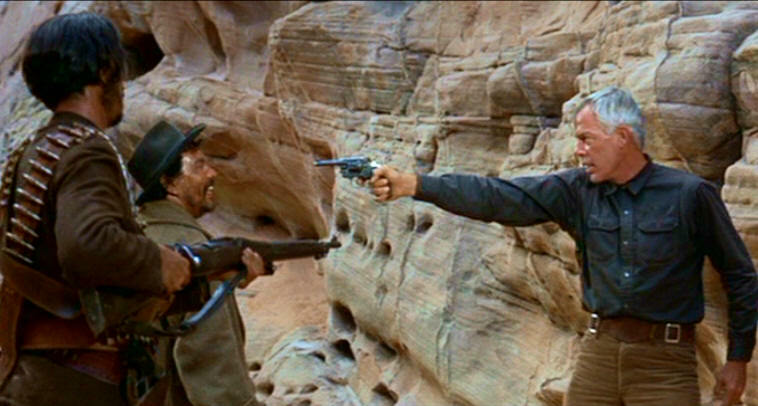 Richard Boone starred as Paladin, a dapper gunslinger who only used his gun as a last resort. Jerry Summers, Alex Sharp, Red Morgan, and Charles Horvath were some of the HC stuntmen who had contributions over the course of the series. The full series is now available on DVD in excellent black & white quality. Director: Charles Marquis Warren Roberto plays "Abruzo"
Notes: This was Roberto's first Western, but his third time on the big screen. He has an uncredited role as "Abruzo" in this artsy Western. HC guest stars, John Pickard and Rush Williams also appear. Notes: HC guest star, Robert Cornthwaite is a series regular here playing John James Audubon. Notes: Jack Kelly, who played Doc Holiday in "Doctor from Dodge" was a regular cast member here as Bret Maverick's brother, Bart Maverick. HC stunt people who contributed over the course of this series included Bob Herron, Bob Terhune, and Jack Williams. 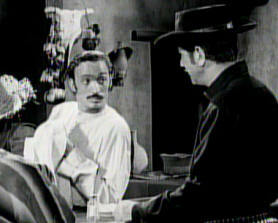 Notes: Roberto played "Alfredo" here in his second appearance on Maverick. Other HC guest actors in this episode included Rico Alaniz, Leo Gordon, and Jorge Moreno. Notes: Roberto appears in an uncredited role as a miner in the saloon, but I'm not sure in which episode. This Walt Disney series ran for just ten episodes about a New Mexico sheriff turned lawyer, and his efforts to outwit the bad guys. HC actor Robert Loggia played the title role. 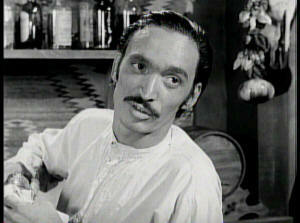 Other HC actors in the series included Bob Hoy, Rico Alaniz, Ramon Navarro, R.G. Anderson, Edward Colmans, Patricia Crowley, I. Stanford Jolley, Joe Maross, and Charles Maxwell. Director: Delmer Daves Roberto plays "Pepe"
Notes: Roberto has an uncredited role as "Pepe" in this story of revenge centered around two men released from the Yuma prison in Arizona. Other HC actors include Nehemiah Persoff, Anthony Caruso, Jorge Moreno, Richard Devon, and Anna Navarro. Henry Wills is credited for stunt work. 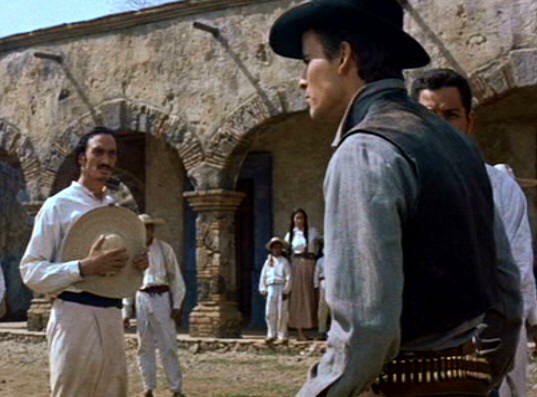 Roberto with Richard Boone as "Paladin"
and Steve McQueen are in the background. 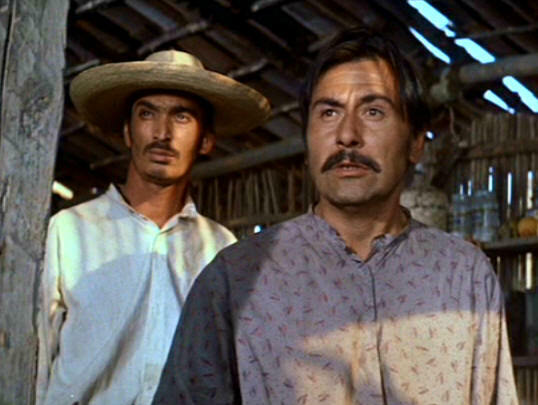 Notes: Roberto had an uncredited role as one of the villagers in this classic Western. He is clearly present in several scenes but has no speaking part. Other Latino HC actors present include Rico Alaniz, Pepe Hern, Natvidad Vacio, and Alex Montoya. HC guest star Joseph Ruskin also has a role. 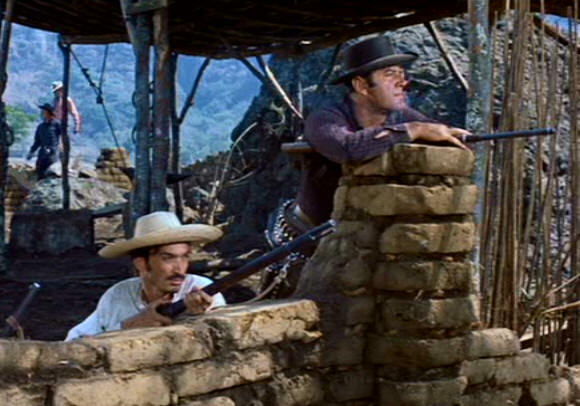 HC stunt coordinator, Henry Wills, was the stunt coordinator for The Magnificent Seven. HC stuntmen included Jack Williams, Loren James, and Jerry Gatlin. 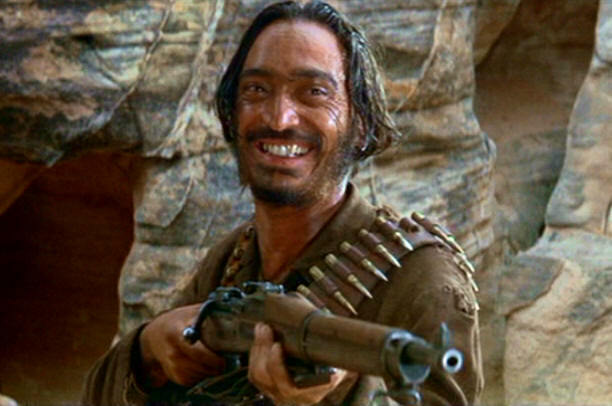 Notes: Roberto plays "Armenderez", one of the gunmen of a corrupt landowner in pursuit of gold that is not his. HC guest star Christopher Dark also has a role. HC stuntmen included Bob Terhune and Jack Williams. 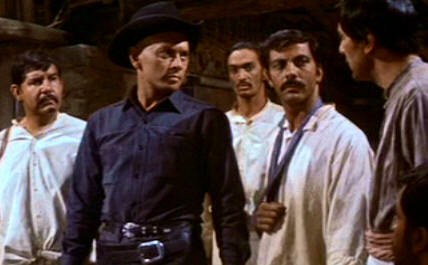 As often happens, Roberto's height makes him standout, here in a cantina with fellow bandidos. 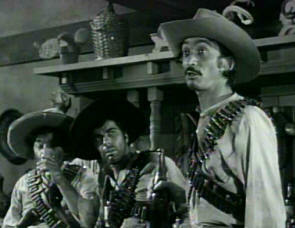 Notes: Roberto plays Angelo, one of four bandidos in this episode that takes place in Mexico. Other HC actors here include Pepe Hern and Than Wyenn. Notes: Roberto appeared in two episodes of Outlaws, which was Don Collier's break-out role when he landed one of the leads for this new television series. An edgy Western played from the outlaw point-of-view, it ran for two seasons in Thursday evening prime-time. Don played Deputy Marshal, Will Foreman. HC producer, Kent McCray, was Associate Producer for the series. Other HC actors in this episode included Ted Markland, Ralph Manza, and Anna Navarro. Notes: Roberto plays "LL Sanchez" in this revolutionary tale about the Mexicans in California during the 1840's. HC guest stars include Rodolfo Hoyos, Jr., Charles Horvath, and Penny Stanton. Notes: Roberto plays an uncredited bandit in this star-studded Western set in the early twentieth century. He has a few lines in Spanish that appear with English captions. He gets shot with an arrow and dies fairly early in the film. This is definitely worth seeing for HC fans though because of the substantial role Marie Gomez (Perlita) plays here as "Chiquita". 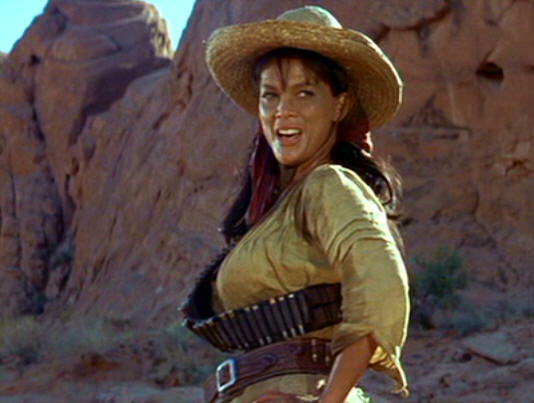 She has some major dramatic scenes and ends up dying in Burt Lancaster's arms. She also does much of the commentary on the DVD. Other HC actors include: Joe De Santis, Carlos Romero, Vaughn Taylor, Eddie Little Sky, and John McKee. Stuntmen connected to HC include: Tony Epper, John McKee, and Jack Williams. Notes: Roberto plays a cantina owner in this sleeper Western that gained a following after it started appearing on cable television. His eldest son, Luis Contreras also appears in the film. The film was noted for its exceptional cinematography. Other HC actors include: Gary Busey and Gilbert Roland.